Having properly working and functioning water pipes in your home is key to having safe transportation of water. Your pipes may need to be replaced because they are leaking, start to see brown or yellow water, the exposed pipes have corrosion, your pipes are made of lead or polybutylene or the pipes are past their prime. Whatever the reason may be, having water pipes replaced in your home, you should trust a professional plumber to do the job right. Residential hot and cold water pipes are made of either metal or plastic. The most common water pipes used are Chlorinated Polyvinyl Chloride (CPVC), Polyvinyl Chloride (PVC), Cross-Linked Polyethylene (PEX), Copper Pipe and Galvanized Pipe. CPVC: Chlorinated Polyvinyl Chloride or CPVC is a plastic pipe that can be used for both cold and hot water piping. This type of water piping is easy to work with and comes as a cream-colored or off-white plastic. 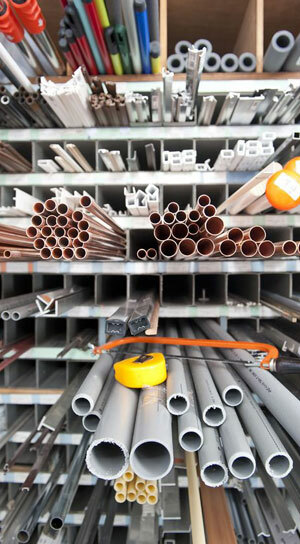 PVC: Polyvinyl Chloride or PVC pipes are an inexpensive, widely used plastic pipe for cold water piping. This type of pipe does not corrode or rust over time, is easy to work with and can be used in a wide variety of plumbing systems. PEX: Cross-Linked Polyethylene is an easy to use pipe that can be used for both hot and cold water piping systems. Due to its flexibility, the need for fittings is generally not necessary making it faster and easier to install. This type of piping can be used in conjunction with metal and PVC piping. Copper Pipe: Can be used for both hot and cold water piping, this type of piping can come in different thicknesses. These are usually labeled with the letters M, L and K. these types of pipes generally do not leak, have a long-life span, are durable and will not pollute your water. Galvanized Pipe: Also, known as iron pipe, galvanized pipe is known to be in systems that were built before the 1970s. this type of piping has a galvanized coating that helps prevent corrosion of the pipe due to water flowing through it. When you need new hot and/or cold water piping for your home contact professional plumbing company Harry Clark Plumbing and Heating Inc.! We provide our plumbing services all over Oakland, CA, Berkeley, CA and throughout the Bay Area!